Usually January 1st marks the annual time to contemplate goals and make resolutions, but in a few weeks many Catholics will begin a new year of sorts that will consist of challenges to learn more about the Catholic faith, grow deeper in a personal relationship with Jesus, and evangelize. 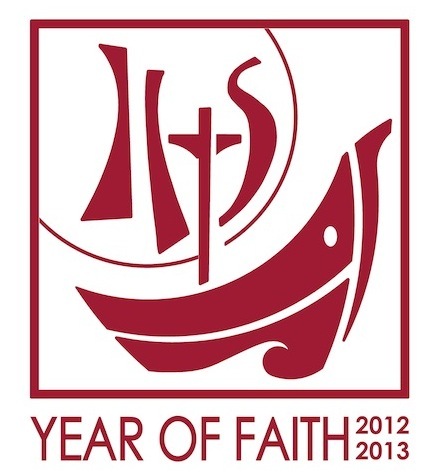 The Year of Faith begins October 11, 2012 and lasts until November 24th, 2013. The Note with pastoral recommendations for the Year of Faith from the Congregation for the Doctrine of the Faith on the Vatican’s website details different events and opportunities for celebrating, as well as explains more about what the Year of Faith entails. I’m really excited about this upcoming Year of Faith, especially since I recently came across the idea for living “A Year Without Fear” in the book She’s Got Issues by Nicole Unice. I feel like the two “years” match up very well. In order to live without fear we must step outside our comfort zones and put our trust in God. It is a daily choice to let go of our false sense of control and say “Yes” to what God asks of us – whether big or small. The best way that we can share the true peace and joy that faith offers is through our actions and interactions with others. I think Saint Francis of Assisi said this best. Preach the gospel at all times — if necessary, use words. As those who are familiar with this blog know, I am passionate about pursuing dreams and following God’s plan. The Year of Faith will be a great time to re-evaluate how we can use our God-given talents to serve others. When people see how joyful we are about what we do (because we truly enjoy doing what we love), it will speak more to convert hearts to Christ than anything we can say. Understanding our faith should not be minimized, though, since it is the foundation for what we do and is necessary in order to explain the reason for our joy to others. My plan for the upcoming year is to continue to look for opportunities and not use obstacles as excuses to live an “average” life. I want to continue to grow in my faith and be open to possibilities I never would have considered to be options in the past. I want to listen and respond to the Holy Spirit when He moves me to act or say something. I plan to enhance my faith by spending more time reading scripture and books about following God’s will! How do you plan to embrace the Year of Faith? What does living without fear look like for you? Loved the post. :) I think living without fear means an increase in our boldness for Jesus.I think this is difficult at times because in our boldness we have to also be loving and to be able to stand up for what we believe without condemning others. Christians are often seen as intolerant when we are just making a stand. I feel that we have been silent too long though and need to take back our country! I personally have been praying for a revival in our home, city, state and county.